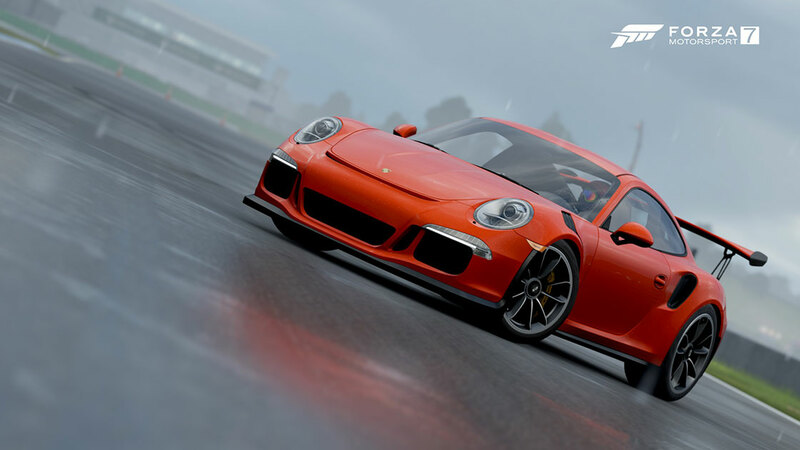 Racers, the green flag has dropped on the 2018 Forza Racing Championship Season. Earlier this week, the Round 1 Rivals qualifier for Series 1 of the ForzaRC dropped and the turnout has been incredible. Thousands of players from all over the world set times in this inaugural qualifier. The next step for qualifiers? This weekend’s Ghost races which will take place on April 7, and our Sunday Heats which will be on April 8. All of that qualifying leads us to our Round 1 Wednesday Showdown races, which will be broadcast live from our Seattle studio. We’ll have two broadcasts that day, one for European racers which begins at noon Pacific, and the second broadcast starting at 6 p.m. Pacific, where our North American players will compete live. You’ll be able to watch it all live on at the ForzaRC Web site, so be sure and tune in to see how the first leg of ForzaRC competition shakes out. One point before we move on with the rest of the Week in Review: Did you know that you can win awesome rewards just for taking part in Forza RC qualifiers? For example, with our upcoming Round 1 Booster Rivals Qualifier, which goes live on April 12, you’ll be able to earn the Mercedes-Benz SL 65 AMG Black Series just for setting a time. We’ll have more great rewards tied to other events as well, so make sure you are registered over at forzarc.com and get your times in! Now, on with another busy edition of the Week in Review! Everyone on the list still has one last chance to better their time in this event, and that chance will happen on today’s episode of #ForzaFriday. Join as starting at 3 p.m. Pacific on the Forza Mixer channel as we welcome back all four competitors (plus Yours Truly) to the show and watch as they make their final attempts to better their lap times. After today, all five of us will lock in our times, which means the Forza Motorsport 7 community will have the entire weekend to beat our times before the event closes next week. Good luck and happy leaderboard hunting! Have you ever dreamt of putting your skills in Forza Motorsport 7 up against one of the best real-world drivers in the world? Your chance begins next week, with the ForzaRC Tanner Foust Challenge, which launches in Forza Motorsport 7 starting on April 11. You probably know Foust from any number of his amazing accomplishments as both a race competitor and stunt driver. During his career Foust has earned championships in multiple racing disciplines including rallycross, drifting, and as a four-times X Games gold medalist. As a stunt driver he’s worked in Hollywood films and has set world records, as he did in 2011 with Hot Wheels when he made a 332-foot- ramp-to-ramp leap in a truck at the Indianapolis 500. Outside of the car, Foust has a busy career as a television personality, notably hosting the American Top Gear series, as well as in his Life in the Foust Lane YouTube series. With the ForzaRC Tanner Foust Challenge, it’s the Forza Community vs. Foust. 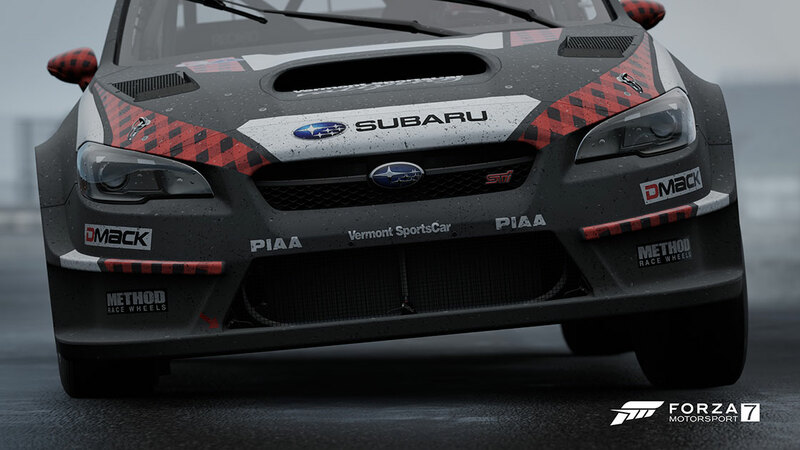 The entire Forza community is challenged to beat Foust’s time on the event leaderboard. You’ll be driving Foust’s race car, the Volkswagen Beetle GRC, on the Dubai Mountain Circuit, and everyone who ends up beating Foust’s final time will win the exclusive 1973 Pontiac Firebird Trans Am SD-455. In addition, come within two seconds of Foust’s final time and you’ll earn the Disco Driver Gear suit. Finally, we’ve got a great participation reward – the 1995 Volkswagen Corrado VR6 – that will go out to all players who set a time in the event. To prepare for the Tanner Foust Challenge, be sure to add Tanner’s Gamertag – SweetTFoust34 – to your Xbox Live friends list, so you can follow his progress on the event leaderboard. We’ll have an update on the event in next week’s edition of the Week in Review! As you see, we’ve subbed in some new Breakout Class Hoppers (we’re keeping the popular A Class around), while changing focus on some of the other hoppers. For example, the current Unlimited Drift RWD hopper will be switching to AWD Drift. After the April 12 refresh, the next hopper update will occur on April 26; look for details on that in a future edition of the Week in Review. We’ve got a new drift Rivals in Forza Motorsport 7 and it was created by you, the Forza community. Earlier this week we put up two polls asking voters to choose the car and the track they’d like to run in a new event. The result is live in the game now, featuring the 1997 Mazda RX-7 on Suzuka Full. If you’d like to influence next week’s Community Rivals event, we’ll have another pair of polls next week. Make sure you follow us on Twitter to let your voice be heard. 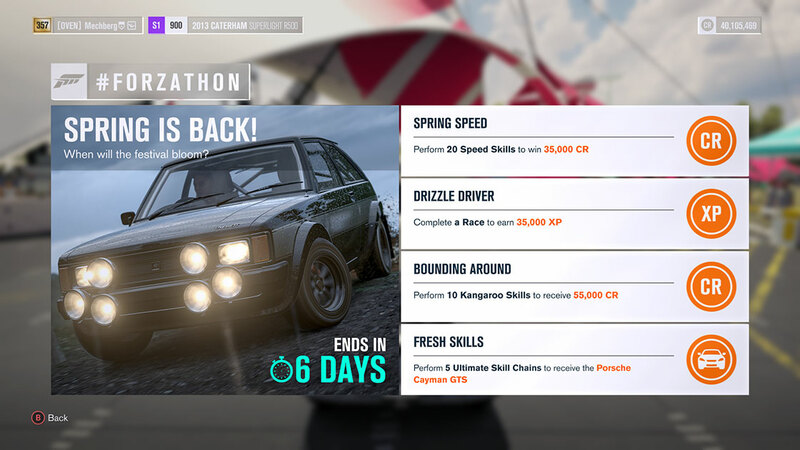 FH3 #Forzathon – Spring is Back! Next week: The April Update! A quick reminder that players can look forward to our next update for Forza Motorsport 7 on Tuesday, April 10. In addition to bug fixes and improvements, we’ll have a new crop of vehicles coming to the game. 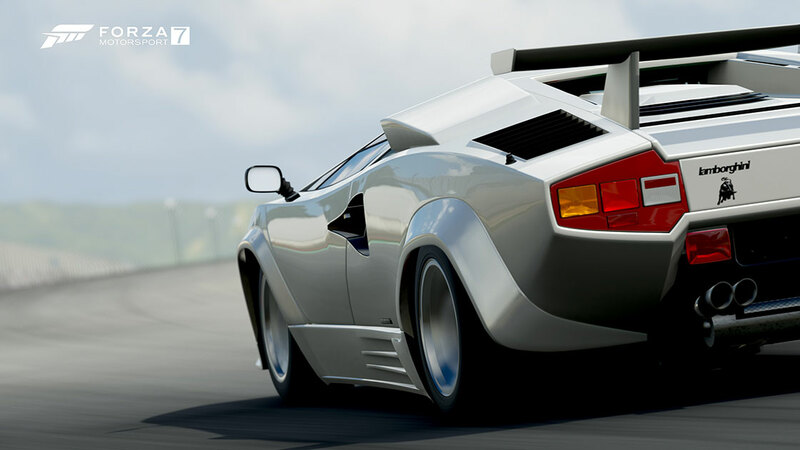 Hit up our DLC Clue thread in the Forza Forums if you’d like to take a guess at what’s coming to the game. See you today for our #ForzaFriday broadcast!